Honda has developed new self-priming pump with a long-term accumulation of experience and technique. The patents are pending in Japan. Unique impeller and Volute casing construction achieved high efficiency and advance priming performance. Non-return valveless construction gives no trouble. Simple pump construction makes Solvent degreasing treatment easy. Foot valve and/or Check valve is unnecessary. MSP can be used up to 80ºC pumping temperature. MSP can be used for liquid contains Slurry. 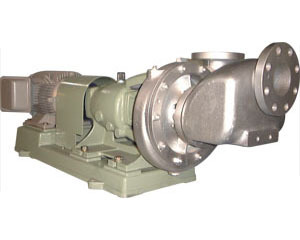 For cast-iron material the pump model is MSPF or MSPGF (However, the impeller is SCS13). Self and external flushing type.